Have you lost your phone and are worried how to locate it? Don't worry, today I will tell you the way, how to track your lost phone. But remember, follow this method immediately after you realize that your phone has gone missing. If somebody has stolen your mobile and has still not done a factory reset on it, you have full chances of recovering your phone. However, once a factory reset is done, nobody apart from the Cops can help you trace your lost device. On an FIR, Police will try to trace your lost mobile phone with the help of the IMEI number of your stolen device. So, as the last resort, it is necessary that you keep the IMEI numbers of all your mobile phones safely. 1. First of all open Google Chrome and type.... Google Android Manager and search for it. 2. Then tap on the first link that you see in the search option. 3. Log in there to the same account with which you had last signed in, on your lost device. 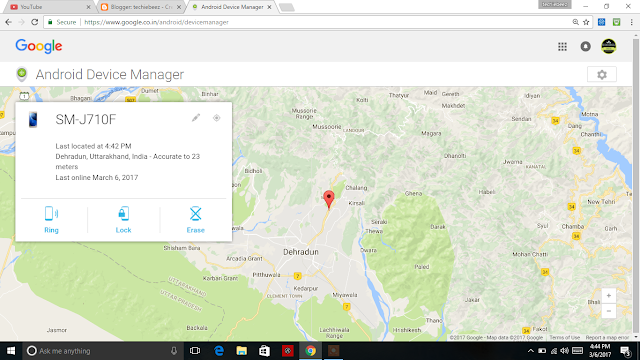 After you have signed in, the Google Device Manager will point you the location of your mobile phone on a map. You can zoom in the location to find the exact place where your phone is. If there is some very important information on your phone, this Google Manager even gives you the option of remotely erasing all your personal data from the lost device.